Back to the grind – SSH Multiplexing – say wha????? So, It’s been quite a while since I posted anything on this blog. Thought I would get back into the swing of things. I have tons of updates but lately very little time. I think I’ll try to dedicate at least an hour a week to get something up here if not more. For now, thought I would add to the latest linux tips n tricks I use to post. I knew about this for quite a while but never really used it, lately for the past few months it’s been a life saver. On avg during the course of my workday, I’m accessing 5-10 systems. This results to an ugly infestation of terminal windows, which surprisingly I have mastered the art of organizing thanks to tmux. Anyways, what this allows you to do is use 1 TCP connection for each server you connect into. Any additional SSH requests created from your client will use existing connection already established. Cutting your login time in half. ControlMaster auto tells ssh to try to start a master if none is running, or to use an existing master otherwise. ControlPath is the location of a socket for the ssh processes to communicate among themselves. The %r, %h and %p are replaced with your user name, the host to which you’re connecting and the port number—only ssh sessions from the same user to the same host on the same port can or should share a TCP connection, so each group of multiplexed ssh processes needs a separate socket. To test this, initiate a single ssh connection to any server. In a new window create another ssh connection to the same server. You should immediately see a difference the 2nd time around. For now, I’m off, check back later. So, things are on a good pace. I’ve been taking advantage of some rare free time that I have. 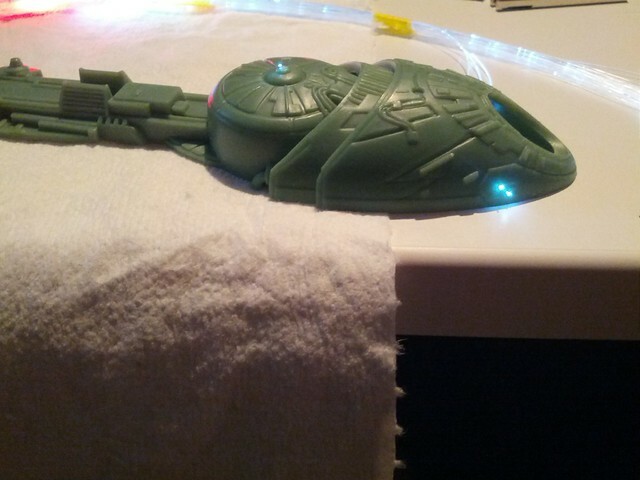 I started to prep the bulkhead lights at the bottom of the ship, so this will be visible in the underside. Using a new method I learned of using clear , transparent Dental Acrylic I was able to cut out the squares and make windows. The dental acrylic diffuses the light and gives it the appearance of a dull soft glow. There is still work to be done, and tons of light leak. Partially because I did not prep the area with foil yet. After doing this most of the light should be blocked. 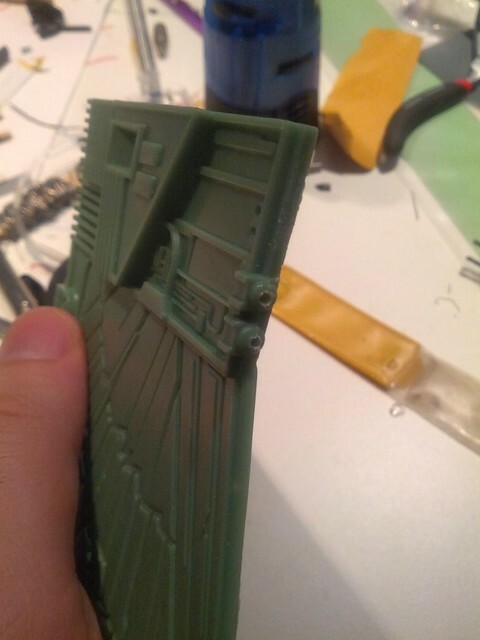 I started to break down the wings and decided it was time to take a closer look. A few days ago, my son was watching Star Trek Generations on TV. 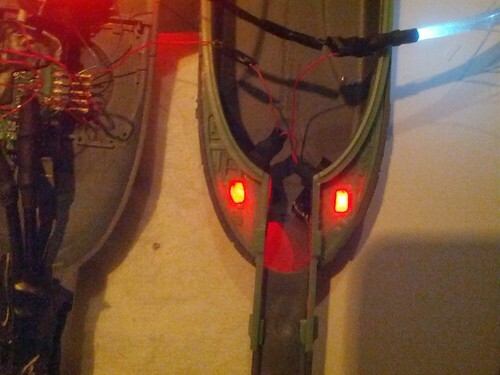 I noticed that the wings of the ship each had 2 flood lights. It looked cool and thought to myself, I should use that as a reference. 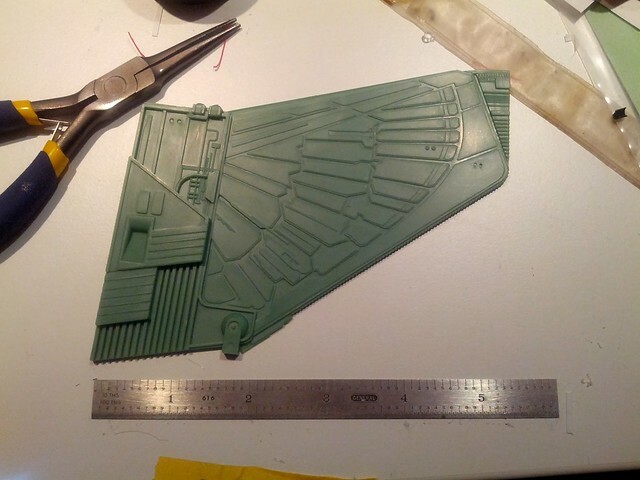 Note the wingspan is rather large for a model at 6 inches, When put together it should look rather impressive. The flood lights can be seen at the top of the wing. 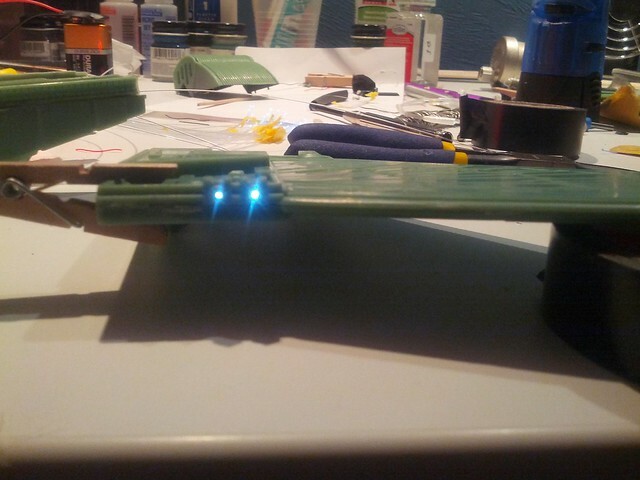 I ran two of the thicker fiber optics to each of the holes and this is how it looks, a nice dryfit shot. 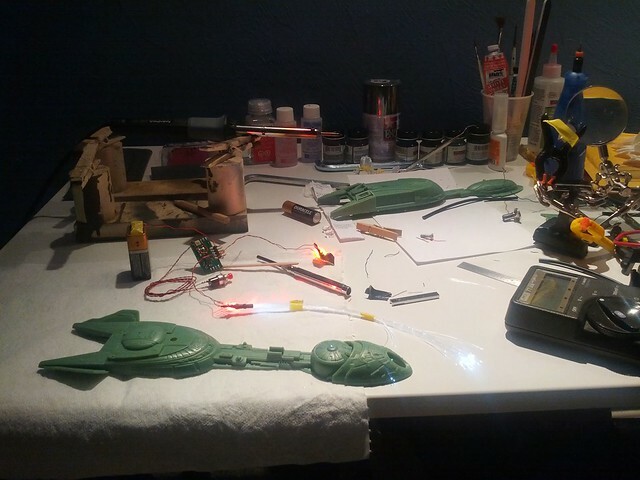 So for a long long time, I have been into building models, I actively contribute to various google modeling communities and have been an active reader on http://www.starshipmodeler.com/ Which covers not only Star Trek, but Battlestar , Star Wars and many other SciFi / Fantasy based kits. Recently I’ve been getting into the lighting end which adds another notch of realism into the kit. I have collected over $300 worth of kits and lighting accessories. 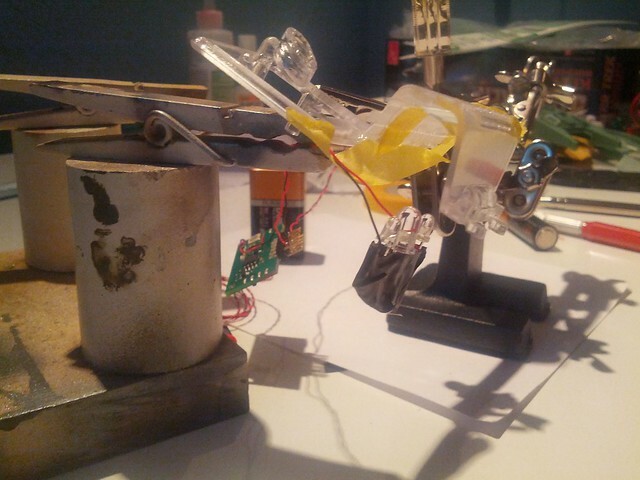 Everything from surface mount diode light strips to standard 3mm/5mm LED bulbs. All easily powered via a 9 volt and a few capacitors. 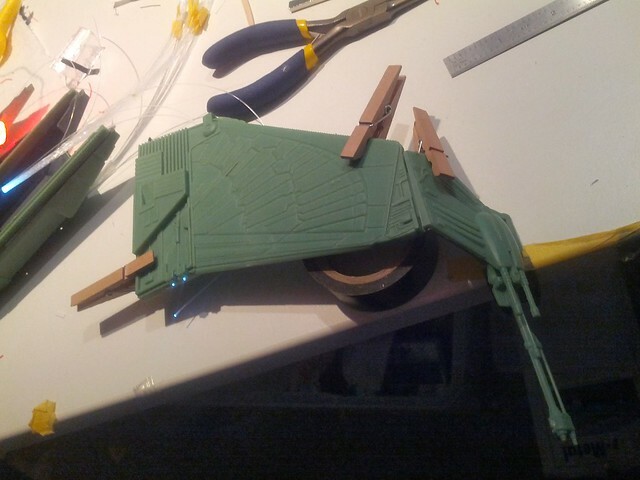 My ultimate goal is to build the 1/350th Enterprise but before taking that on I started a Klingon Bird Of Prey and would love to show the results of my works so far. I began with the engines. First step to make this as convincing as possible is to use some sort of reference. Well, mine was about an hour of parsing through google images and trying to devise a way to make the light diffuse properly in the engine bay. 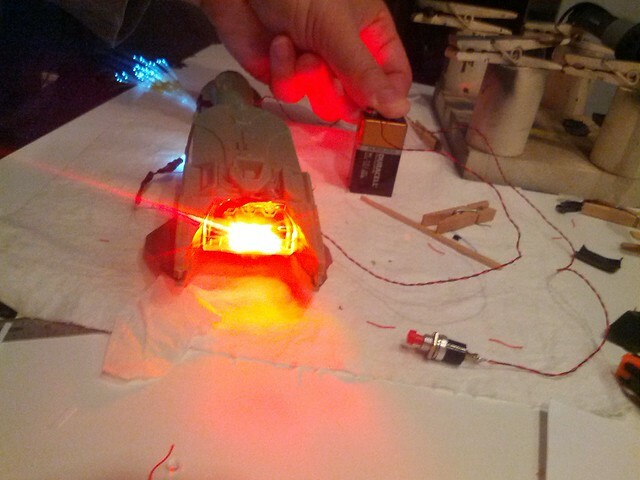 And when turning on for the first time, the Styrene combined with tissue paper creates a soft orange glow. 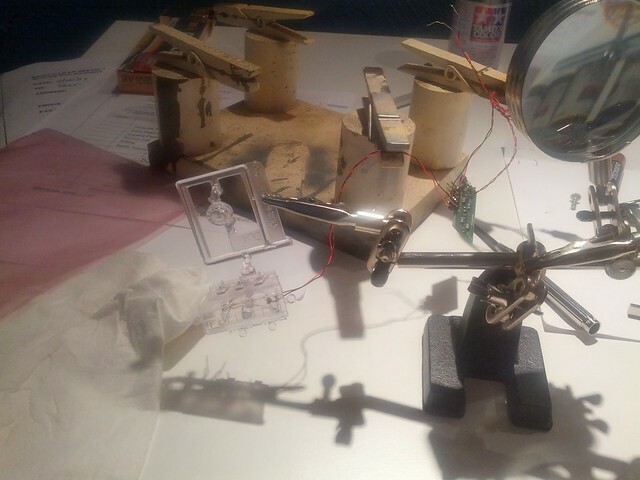 After dry fitting the electronics and adding some more tissue paper progress was made. After getting the engine sorted out I put those pieces aside and began to work on the windows. 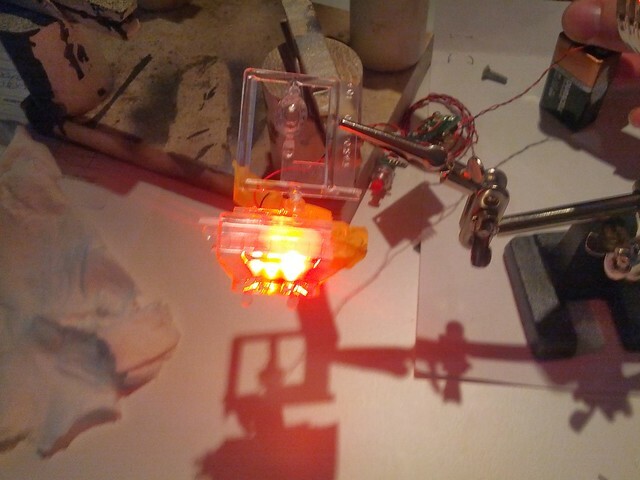 I was using small fiber optics to install in the windows. 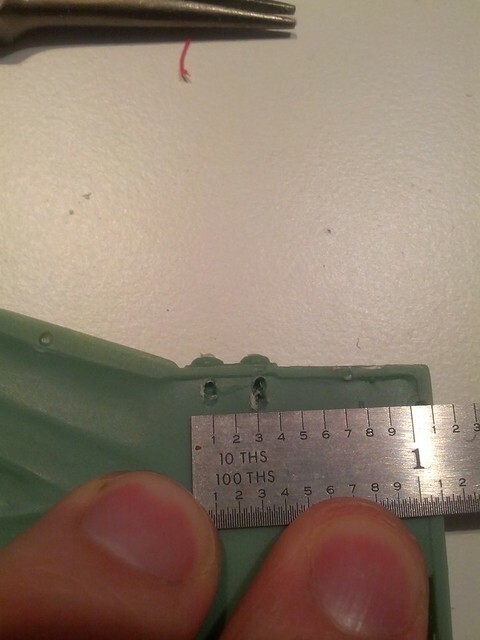 which would require drilling out the desired locations with a dremel and 0.7 mm bit. 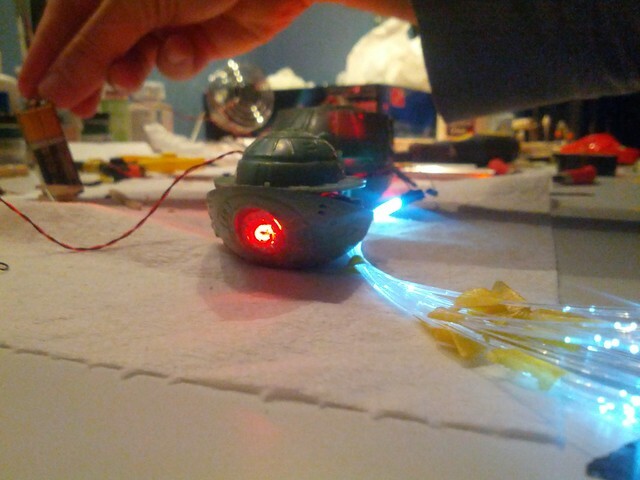 The fibers are created using 1 white led and some heat shrink, Using a soldering iron gently melt the ends of the fibers and bunch them evenly together, once attached via heat shrink there should be virtually no light leak coming from the heat shrink casing, forcing all of the available illumination through the fiber. 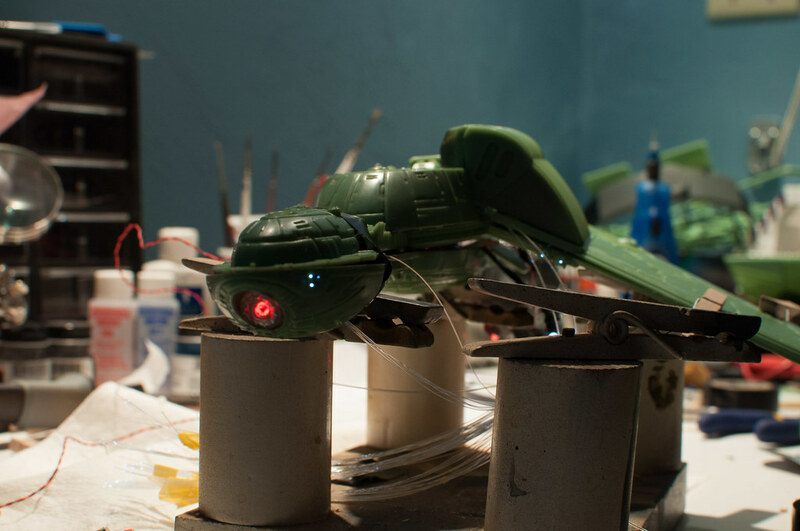 After this was done, I drilled out two small windows and a bottom strobe light on the dorsal side of the ship and ran the small lights through. See below for the effect. Fiber LED and 1st set of windows. Close up of the windows which will be right above the torpedo launcher and bottom stage light. To create the ring effect, using a piece of heat shrink and a bundle of fiber attached to a red bulb, i was able to lay the fibers flat on a strip of electrical tape. 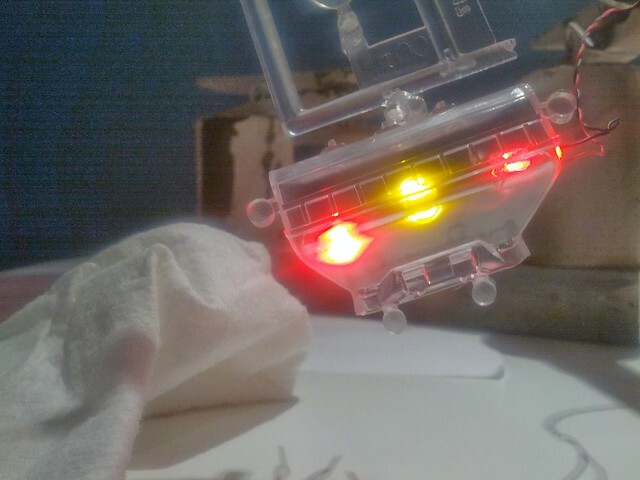 Then using another bundle of fiber attached to a white bulb place them in the middle of the stretched out red fibers. Slowly wrap the red fibers around the white bundle to create a ring effect. Just to clarify this does work on Ubuntu / Raring, I’ve also installed it to my Windows and random laptops around the home. When working late night, your eyes don’t feel like they are being burned out of your head from staring at the computer screen. Today was the official announcement for the Nexus 7 supporting 13.04, for all you Nexus7 users that may have missed todays ubuntu meeting on Freenode. If some of you want to dist-upgrade from 12.10 -> 13.04 then you may hit some known issues. These are the only bugs I found when dist-upgrading. We are urging everyone to re-flash if you don’t want to deal with the workarounds. In recent news a custom build of Ubuntu has hit the internet for the Nexus 7. That means wiping android and testing out this fresh build natively on your tablet !! With a growing number of users filing bugs everyday my co worker recently posted an awesome guide for those of you wanting to file bugs and contribute to the community. Check it out! Lines 7 – 9 are simply creating my directory if it doesn’t exist. Python 3 also makes use of hashlib to generate the hashsum.. If you don’t need a checksum file then heres some alternate code you can use!